I know there have been several posts about feeling iffy about turning your car in for HG repairs. So I figured I would do a review of my experience. First, I was having issues with my car that I didn't realize I was having. That being said Ford sent me the recall asked me to come in. They performed the test and stated I was losing 3psi during the 5 hour test @ 20 psi. They returned my car to me on Monday. Had the parts by Wednesday and scheduled me in for repairs the following Monday. So all in all very fast turn around time. They told me they would have it for 2 days. They took it in on Monday and was ready for Pick up on Tuesday. Due to a technical issues I never got the call and ended up calling on Friday asking about my vehicle. As the car started getting up in age I noticed that the car would stall when sitting at traffic lights. You would go to take off and you would hear a hard clank and it would die. Many times it would show it self as a bogging. Other times I would be driving and I would put my foot on the gas and it would seem to continue on as if I never hit the gas. When it did it would hesitate or stutter as if ECU or PCM would cut timing or fuel. I picked up the car Last Friday. I take my hat off to the dealer. They continue to respect my wishes for them not to wash the car. I got in started it right up and I could tell a different. The start was crisp and smooth. Lately the idle was a bit rough but nothing to write home about. When applying gas the throttle felt responsible (like when I first purchased it). The bogging has yet to return and acceleration is very much like it was first purchased it. My overall review would be this. If you receive a notice to go in for the maintenance I would recommend that you do it. My frustration with the car is almost non existent now that they have fixed it. The car has only stalled once since getting it back. Not sure if it was my fault or the auto shut off feature. I hope this helps anyone on the fence. (2/21/18) I am now getting Disabled mode informational while driving for more than 30 minutes and my oil temps seem to be higher than they were before. Ford also owned up to having changed the oil without replacing the sticker on my windshield. So be aware that it's not listed on the work order but that the oil should be changed as well. (2/27/18) I wanted to update my post again this week. Ford has not been able to explain to me why my car was going into limp mode. So to my dismay they got it and was not able to replicate the issue. Code never repeated and I've been driving it now for 4 days and the code has yet to return. I do want to take some time to re-install the ETS spoofer and see if the issue returns. I would also like to find out if they patched my PCM. Outside of this I have not experience any performance issues or degrading of performance. It is not impossible but I find it highly unlikely that I've driven for 8.5k miles with zero issues and then suddenly I do. 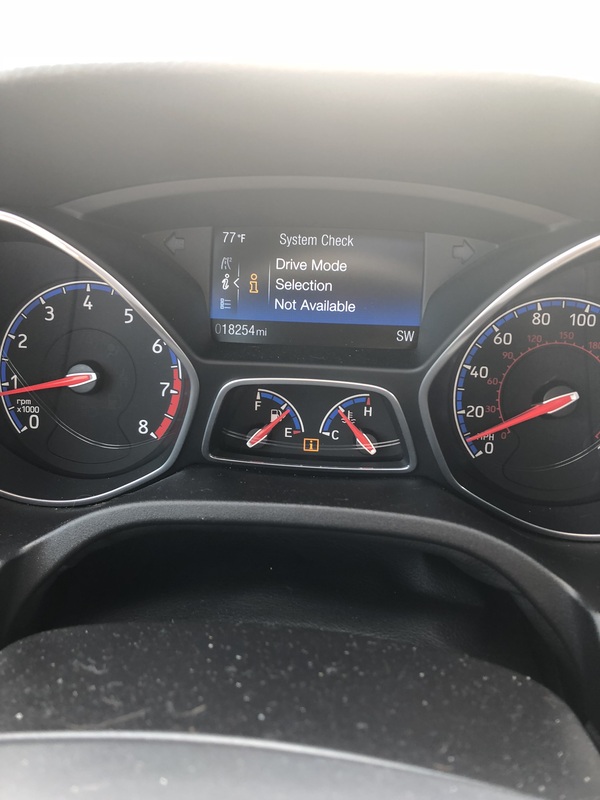 I get the car back from Ford and it is going into Limp mode and after getting it back they removed the part from the car and limp mode stops appearing. What is highly curious is they didn't say a thing about my BOV... So I am confused as far as Ford is concerned. 03/16/18) I have officially put 2,000 miles on the new head gasket. Lately, I have noticed zero degrading in the vehicle at all. The cold weather has been really great for creating easy quick boost. BOV is working good and I now have 1,000 miles with the ETS spoofer installed with zero issues. This morning I passed a Gray RS on 95. If that was you sorry for not saying hi but I was pressed for time and driving with a purpose. I have to say I was causing for a while around 88 but it honestly felt like I was doing 65. Power is great, handling is great and I have zero complaints. My dealer where I got my repairs was Purvis Ford, Fredericksburg, VA.
(03/30/18) So as life usual has it. Right before you go to make a major change there is always a monkey wrench. Since we are on a Focus forums I guess you all can assume what I am about to say. So yesterday coming home out of the blue the car disable drive modes again. It stayed like that till the evening time. I drove it with the mode disabled to Ford for them to scan. All this went down Thursday 3/29/18. This morning I get a call from Ford they would like the car to do some program updates on the vehicle. I will post up more after the service. (04/12/18) Ok, I have settled in. I moved to North Carolina recently for a change of jobs. Right before I left I had issues with the drive modes again. The manager met me on Friday and applied a recall to this issue. After applying the fix I drove the vehicle down to Charlotte on a 500 mile trip looking and investigating the area. At this time I have not seen any additional issues regarding the disabled drive modes. They left my modifications in place and performed the upgrade. I am currently sitting at 20k with no further issues post head gasket repairs. (5.24.18) I've been gone for a bit. Sorry for that. I wanted to update everyone on my experience so far. I am officially at 24k miles on the vehicle and I am experiencing the stalls again. The only time I have an issue with stalling is when the auto off is allowed to operate feelingly. So lately I have been disengaging the auto off feature and the stalling has been a lot better. Engine is still good. I've been use to boost and I can now feel the system releasing boost to control performance. This is not a good feeling because it feels like the car is bogging. The only difference is once the RPM's climb the boost re-engages again and it pulls hard as hell again. I have a few ideas for how to fix the hard clutch pedal. I hope to be able to purchase the items required and test it out. This issue has been rearing it's ugly head a lot when i commute between VA and NC. The pedal continuously gets really stuff and interferes with clutch operations. That is all I have for this update. Bringer and FoRSV like this. I was getting slightly flustered with mine. I thought it was many a clutch issues and I was pondering getting a Spec clutch. However, after the head gasket replacement. It feels almost exactly like it did when I rolled off the show room floor. I am very pleased. Cool, my car has all of the symptoms you mention...hopefully they are resolved once the parts arrive. Not that I wish for you to experience bad things. It makes me feel better I am not alone. Yup, have the same rough idle on my 17 with 12k, and occasional drops in RPM and a spike as the ECU tries to compensate. Have yet to have it stall though. Replaced the spark plugs as a test, but that made no change. Just waiting a couple weeks for them to get the parts issues sorted out, and to allow the mechanics at the dealerships to get a few repairs under their belt before tackling mine. Plus if I'm lucky, I'll have some scoring on the cylinder walls and get a full new long block. Best wishes. I was hoping for a new head but it seems that the head gasket has to be failed for some time before the head warps. I have 15k on my car and I needed to be between 5 and 7 psi loss to get a new head. The rep was nice enough to tell me the qualifications on getting a new head. Thank you for this review. I think this thread would be most useful if you continue to update us over the next few months on how the car is doing and if any new issues arise. Understood and I will be happy to do so. Well, as of last night I started getting drive mode disabled. This is only 48 hours after the HG replacement. Not sure if they are linking. During lunch I will check to see if somebody unplugged my ETS flapper spoofer. Head gasket and PDU issues really that prevalent?